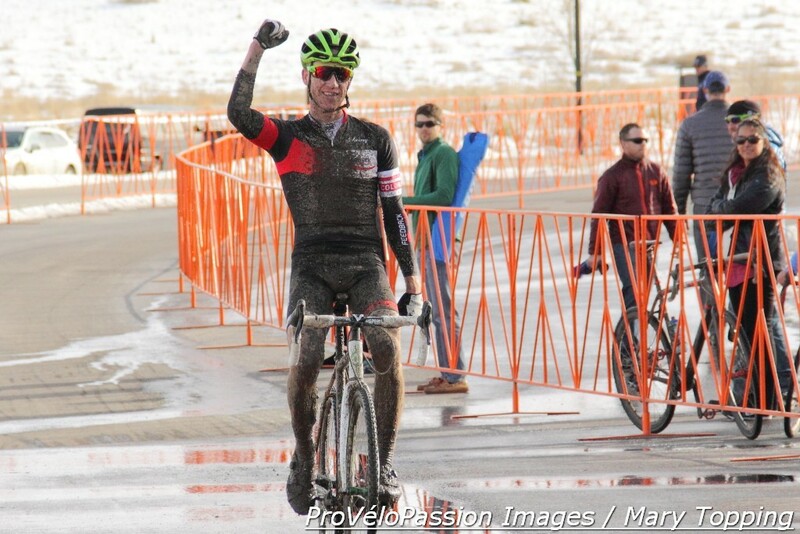 Tim Allen (Feedback Sports) reaffirmed his mastery in the art of single speed cyclocross on Saturday. A smooth operator in muddy conditions, the former national champion took his first Colorado one-geared cyclocross title on the undulating Castle Rock course that has hosted the state championships for several years running. Allen won by 50 seconds over Brady Kappius (CLIF Bar). After passing First City rider Dan Porter who snagged the hole shot, the pair raced together briefly with Kappius at the front. While Allen pulled away in the next lap Kappius held on to second place ahead of last year’s champion, J.J. Clark (ProCycling), who finished third. Will Iaia (Groove Subaru Excel Sports) came in fourth. The current leader in the Colorado Cross Cup competition, Jesse Swift (Gates Carbon Drive), suffered from brake problems and finished fifth.